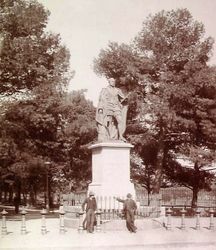 The statue erected by the people of New South Wales commemorates the Prince Consort of Queen Victoria, Prince Albert. The bronze statue of Queen Victoria’s husband was erected in 1866 five years after his death. It was moved to the Botanic Gardens in 1922 and was relocated in front of Hyde Park Barracks in 1987. Prince Albert of Saxe-Coburg and Gotha (26 August 1819 – 14 December 1861) was the husband of Queen Victoria of the United Kingdom of Great Britain and Ireland. He died at the early age of 42, plunging the Queen into a deep mourning which lasted for the rest of her life. On the news of the death of the late lamented Prince Consort reaching the colony, a subscription was entered into for raising funds to erect a statue to his memory. The sum necessary about £3000 was transmitted to England, and in due time the statue reached the colony. It has been placed on a handsome pedestal, in one of the finest sites in the city, at the northern entrance to Hyde Park, opposite Macquarie-street, and was uncovered on St. George's Day, the 23rd ultimo, in the presence of his Excellency the Governor (who delivered a suitable address on the occasion), and the largest assemblage of citizens of of all classes ever witnessed in Sydney. The numbers have been variously estimated, but those best qualified to judge say that from twenty to thirty thousand were present. The statue is the second of the Prince, cast in bronze, and was designed by Mr. W. Theed, Henrietta-street, Cavendish-square. London. It was cast at Nuremberg, and was on view in London in March, 1865. The model was originally executed by command of her Majesty and sent as a present to Coburg, a bronze cast having been taken from it by order of the Duke of Newcastle for the people of Sydney. Of all the numerous likenesses now extant, this was considered by her Majesty to be the best. The figure is ten feet high, representing the Prince in a commanding attitude dressed in the robes of the order of the garter. Not only is it to be regarded as a fine work of art, but as a specimen casting in bronze scarcely to be excelled. The railings around it are of the universal trident, as used at the Great Exhibition of 1851. The basement is oval, 20 feet by 16 and of colonial stone with protecting pediments on which it is intended to place lions. The total height of the statue and pedestal is 20 feet 6 inches. Empire (Sydney), 23 May 1866.